More Michigan children are living in poverty. According to this year’s Kids Count data, more than one out of five children - or 22.6 percent - in Michigan lives in poverty. Every county in northwest lower Michigan has more poverty now than it did in 2007 before the recession. 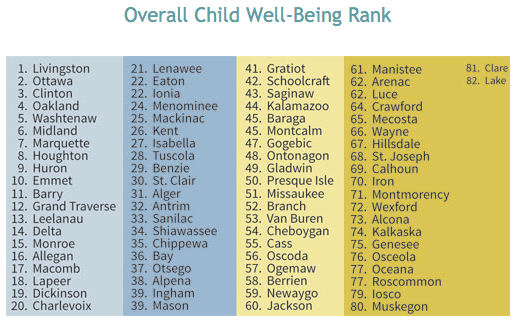 This child well-being ranking for counties in Michigan includes multiple factors, including poverty. In northwest lower Michigan, the counties are split. About half the counties are above the state average and half are below it. Grand Traverse and Leelanau counties have under 15 percent of kids living in poverty. But a quarter of kids in Kalkaska and Wexford counties are growing up poor. Lake County has the highest percentage in Michigan. Forty-four percent of its kids are living in poverty. The county also saw the highest increase of almost 10 percent in child poverty between 2007 and 2014. Wexford, Manistee and Antrim counties each have around five percent more kids living in poverty since 2007. According to the study, growing up poor can contribute to behavioral problems and affect a kid’s ability to learn.